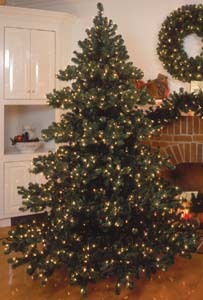 Artificial Prelit Chesapeake Christmas Trees: Niche-Gifts.com. Niche' Gifts offers [Ground Shipping is Always $2.95!] and secure online shopping! Layers of lighted branches reach skyward, as if nature had blithely stacked one platter of foliage atop the next. The Chesapeake's tiered silhouette has long been a holiday favorite. In the airy spaces among its layered branches you can comfortably nestle even the largest of ornaments. Each decoration will be serenaded by the tree's duet of deep green hues, which play in harmony to delight your eyes.